I posted an instagram photo of Sister standing at our Lego table earlier today...and realized I never shared this project. It's seriously so easy and it's been such a big help to keep all our Legos in one spot. Background: Big Brother received this train table (which I highly recommend...comes with plenty of track, cars, and is compatible with all the Thomas cars) for his 2nd birthday. It was fun until he realized building tracks from room to room and up and down hallways is way more fun. So the table sat unused in storage for the past few years. I debated getting rid of it until I realized it would be easy to re-purpose. All I did was generously spray the backs of the green boards with adhesive and then "tiled" the table top with the base plates. If we ever want to use the table for trains, we can still flip it over. The boards weren't exactly a match to the table's dimensions, so I ended up cutting smaller strips to fill in the edges. Regular kitchen scissors cut through them easily. Once the boards are down, the seams are pretty much unnoticeable. And when we're done playing, two under bed boxes fit perfectly underneath the table for storage. awesome! 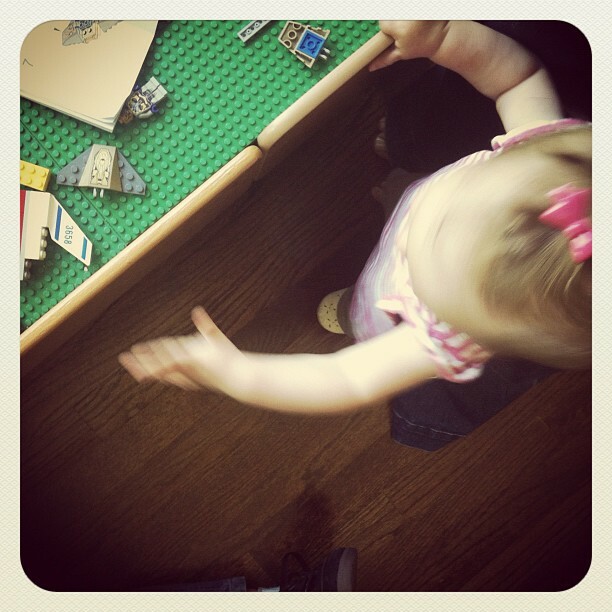 I may have to invest in some of those 10x10 lego "tiles". Thanks! Oh wow! Thanks for posting. We have a similiar table and Legos everywhere :) I can't wait to try this! Great idea! Our trains outgrew our table so this will be perfect for when we get to legos. Love this! My boy is outgrowing his train table and starting to LOVE legos! I found your blog by googling how to turn a train table into a lego table. I believe we have the same train table that you do. I was wondering if you could tell me how many baseplates you ended up using and if it sits in the train table ok with the lego side down if you flip it over to use as a train table again? Thanks! Exactly the information I was looking for, plus ideas I had not thought of. THANK YOU! !